[161 Pages Report] HVAC controls are used to automate and control air conditioning of various types of buildings with the help of controls, sensors, and controlling devices such as thermostats, control valves, and controllers. It eliminates the need for human interference for maintaining the temperature in a building, thereby increasing the safety, especially in hazardous and complex setups in industrial buildings. In the long run, HVAC controls help reduce both energy consumption and cost. 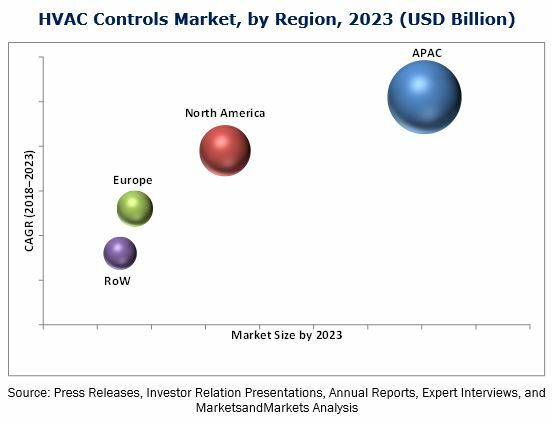 The HVAC controls market was valued at USD 11.71 Billion in 2017 and is expected to reach USD 27.04 Billion by 2023, at a CAGR of 12.1% during the forecast period. The base year considered for the study is 2017, and the forecast period is between 2018 and 2023. Major factors driving the growth of the HVAC controls market include the need for efficient use of energy in buildings, growing construction market, increasing adoption of IoT in the HVAC industry, and rising demand for building automation systems (BASs). 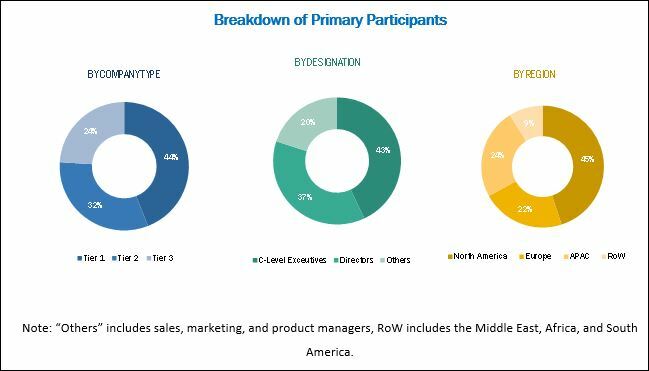 The objective of the report is to provide a detailed analysis of the HVAC controls market segmented on the basis of system, component, implementation type, application, and geography. It also provides detailed information on the major factors influencing the growth of the HVAC controls market. The research methodology used to estimate and forecast the HVAC controls market begins with obtaining the data on the revenues of key vendors through secondary research via sources such as The American Society of Heating, Refrigerating and Air-Conditioning Engineers (ASHRAE) and Air Conditioning Contractors of America Association (ACCA). The vendors’ offerings have also been considered to determine market segments. The bottom-up procedure has been employed to arrive at the overall size of the HVAC controls market from the revenues of key players. After arriving at the overall market size, the market has been split into several segments and subsegments, which have then been verified through primary research by conducting extensive interviews with the key experts such as CEOs, VPs, directors, and executives. The market breakdown and data triangulation procedures have been employed to complete the overall market engineering process and arrive at the exact statistics for all the segments and subsegments. The breakdown of the profiles of primaries has been depicted in the following figure. Some of the major players operating in the HVAC controls market are Honeywell (US), Johnson Controls (US), Schneider Electric (France), Siemens (Germany), and United Technologies (US). The HVAC controls provided by these players are required to meet the standards mandated by governmental organizations, such as International Organization for Standardization (ISO). This research report categorizes the HVAC controls market on the basis of system, component, implementation type, application, and geography. The integrated control systems market is expected to grow at the highest CAGR between 2018 and 2023. The integrated control system includes the combination of temperature, ventilation, light, and other control systems. This combined effect enables the user to benefit from the different features of different controls. Integrated control systems are also expected to integrate communication modes such as Wi-Fi, cloud computing, and the Internet of Things (IoT) which would help in controlling, monitoring, and maintaining the HVAC systems from virtually anywhere. The sensors market is expected to grow at the highest CAGR between 2018 and 2023. Sensors are responsible for sensing various elements in the atmosphere and sending this information accurately to controllers, which can then be processed for taking appropriate actions. These sensors also detect whether the actions taken by controllers and controlled equipment have given the desired results. The development of wireless technology and its application in IoT and smart homes is fueling the market for sensors in HVAC controls. The market for the new construction of the HVAC controls for implementation type is expected to grow at the highest CAGR between 2018 and 2023. Infrastructural developments, increased level of standard of living and focus on the development of energy-efficient HVAC systems are fueling the growth of the HVAC controls market for new construction. Various government regulations to implement energy efficient HVAC system and controls has resulted in the wide adoption of HVAC controls in new buildings. The HVAC controls market for commercial application is expected to grow at the highest CAGR between 2018 and 2023. The rise in the adoption of smart buildings and green buildings increases the use of smart sensors and HVAC control equipment, such as programmable thermostat, which would save a lot of energy in these buildings. The application of HVAC controls in commercial buildings ensures switching on or off the HVAC equipment in a particular area, which is not currently occupied. In a huge commercial complex, all the areas are not constantly occupied by a number of people; hence for sensing occupancy of the people in an area, HVAC controls play an important role by enabling efficient use of energy. The HVAC controls market in APAC is expected to grow at the highest CAGR between 2018 and 2023. Among major countries in APAC, China is contributing immensely to the HVAC controls market. China is one of the fastest-growing economies in the world according to an announcement made by International Monetary Fund (IMF) in 2017. It also has a large construction industry, which is driven by the need to meet the increasing demand for HVAC in the country. Growth in building construction and strict regulations for maintaining high energy efficiency of the HVAC equipment in new buildings are increasing. China plans to have 50% of all the new buildings to be certified green buildings by 2020. This requires an efficient utility of energy, which can be achieved with the use of energy-efficient HVAC systems and HVAC controls. Major factors restraining the growth of the HVAC controls market include lack of awareness about the benefits of HVAC controls and huge investment for carrying out R&D and product differentiation. Key market players such as Honeywell (US), Johnson Controls (US), Siemens (Germany), Schneider Electric (France), and United Technologies (US) have adopted strategies such as product launches and developments, expansions, acquisitions, agreements, contracts, and partnerships to gain a competitive edge in the HVAC controls market.